This PC Software is Called Freelabs Restart Computer. Freelabs Restart Computer is a Simple Tool that will Restart/Shutdown/Logoff your Computer on a Timely Basis. It's main window stays on Top of your Windows, It's Small,Easy to Use and Transparent. There are Some Features and Useful Options that might Interest You! 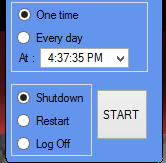 Freelabs Restart Computer's Main / Key Features This Application is like a Sleep Timer on TV, You will Set the Application to Shut Down, Restart or LogOff at a Specific Time even when your Friends are Using it, This will Make your Computer More Secure and Safe.